My wife and I met Kay & Marsha at an event called King’s Table over 2 years ago. We had an instant connection to them because they are also an interracial couple. We learned that evening that they were expecting a baby while still living in an outdoor homeless shelter in Santa Ana. Our hearts connected with their situation and they happily agreed to join the Faces of Santa Ana family. My wife, a trained painter, had contemplated for a while coming along side me to collaborate on a painting, we both agreed this was the portraiture. Our goal was to not only honor Kay &Marsha’s relationship but explore a new venture as a married couple ourselves. 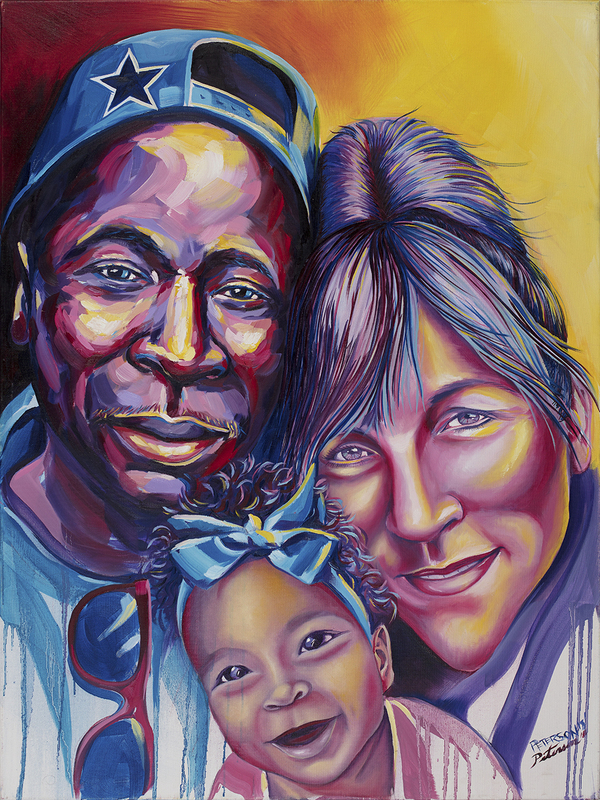 Before my wife and I completed their portrait Marsha had given birth to a baby girl named Brooklyn and they had been granted permanent support housing in Santa Ana. We decided to add Brooklyn into the portrait to commemorate their new addition. Brooklyn is almost 2 years old, Dad, Kay is a full time Chef at an Italian restaurant and Mom, is raising a wonderful daughter and holding together her household. PURCHASE KAY, MARSHA & BROOKLYN’S PORTRAIT.